Most folks realize that habitat fragmentation -- the chopping up of once-intact habitats into small 'islands' encircled by a hostile 'sea' of human-modified lands -- is an enormous peril to Earth's biodiversity. But what many don't realize is that it's a growing danger to our climate as well. Two new studies reveal that habitat fragmentation can cause tropical forests -- the most carbon-rich forests on the planet -- to lose a big chunk of their carbon. And that lost carbon goes straight into the atmosphere, increasing the impacts of harmful climate change. The first study, by Rebecca Chaplin-Kramer and colleagues, suggests that fragmented tropical forests are losing a remarkable 25 percent of their biomass (and hence their carbon) within the first 500 meters of their forest edges. And this carbon loss extends even further into fragments, they conclude, with around 10 percent of all carbon being lost up to 1,500 meters from forest edges. In the tropics, as elsewhere, we're facing an increasingly fragmented future. Their study was based on detailed analyses of satellite imagery from across the tropics. And if correct, these findings suggest that fragmented forests are a seriously big source of atmospheric carbon emissions. Why are fragmented forests losing so much carbon? In a word, a lot of trees are dying near forest edges, especially towering canopy trees that contain a great deal of carbon. The first work to reveal these effects was led by ALERT's Bill and Susan Laurance and Thomas Lovejoy. Published nearly two decades ago, these studies showed that microclimatic stresses and elevated wind turbulence near the abrupt, artificial margins of Amazonian forest fragments were major tree killers. At the time, these studies were considered so striking that they were published in the world's top scientific journals, Science and Nature. Further disturbances are caused by edge-related forest fires. In the Amazon, for instance, many cattle ranchers burn their pastures each year to control weeds and produce a flush of green grass for their cattle. These pasture fires can penetrate hundreds or even thousands of meters into the interiors of nearby forest fragments, killing many trees and other plants. The remote-sensing study by Chaplin-Kramer and colleagues generalizes these earlier findings, and suggests that they are occurring in many tropical forests around the world. The second study, by Carolina Bello and colleagues, is perhaps even more ecologically intriguing. It's well known that big animals such as primates, large fruit-eating birds, elephants, and other seed-dispersing animals disappear in forests that have been fragmented or heavily hunted. These animals often find the limited universe of a forest fragment too small for survival, or vanish when killed off by hunters armed with rifles, snares, and other lethal technologies. Many of these vulnerable animals are key dispersers for large-seeded trees. Without the animals, the big seeds just fall at the base of their parent trees, where they are killed by enemies such as voracious seed beetles or species-specific fungi thriving near the parent tree. And large-seeded trees have big seeds for a very good reason: these seeds are designed to germinate and grow in the densely shaded conditions of the rainforest interior. The seedlings need the nutrients stored in those big seeds to germinate and survive -- sometimes waiting years for a treefall gap to appear nearby, at which point the seedling has enough light to start growing into a tall tree. In terms of their carbon storage, such big-seeded trees have two key features. First, because they grow slowly they tend to have dense wood -- and that means they store a lot of carbon in their heavy tissues. Second, these big-seeded species often grow into giant canopy or emergent trees, which again means they store a lot of carbon. So, what happens if you kill off most of the animals that disperse big seeds? You get a forest that's progressively depleted of the towering, densely-wooded trees that make rainforests so carbon-rich. 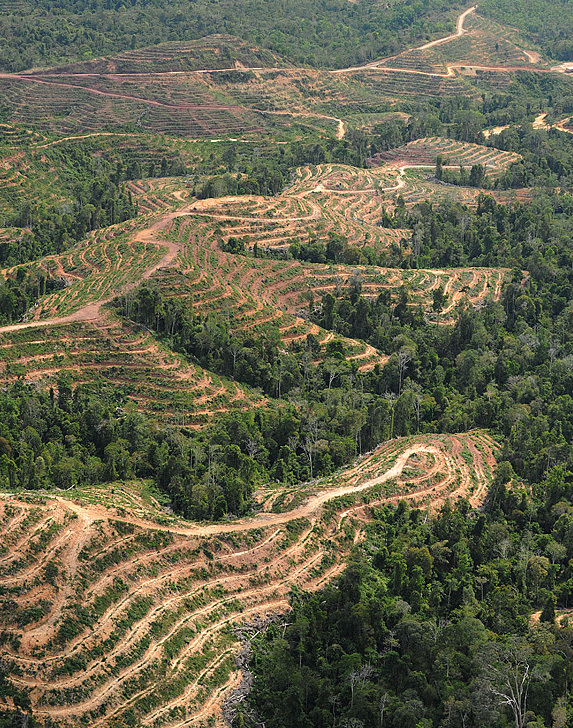 The bottom line: fragmentation and defaunation are really bad for tropical rainforests. They play havoc with their ecology and diminish their biodiversity in diverse and surprising ways. And beyond this, by disrupting the capacity of rainforests to store a lot of carbon, habitat fragmentation worsens harmful climate change -- and that is really bad for us too.